Anybody forgotten to turn back their clock earlier this month and ended up missing the occasion for a sleep in? April already and with that, we’re well into Autumn (although it sometimes feels like winter!). 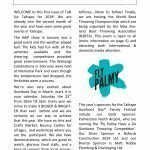 Welcome to another issue of the Talk up Taihape. Plenty to talk about!